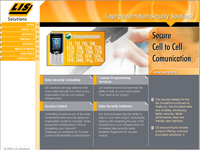 LIS Solutions is a data security company providing services to protect data while it on mobile devices, desktops, memory device or en route electronically. IBCnet was hired to design the site, provide search engine optimization services as well as manage a national wide AdWords campaign. ASP.net, VB.net, MSSQL 2005, CSS, HTML, and Java.